Home Companies Changzhou Honggui Electronic Co., Ltd.
Changzhou Honggui Electronic Co., Ltd.
9) Color and length : according to the clients’ requirements. 11) Suitable for all SCART-SCART connections, including composite, S-VHS and RGB. 8)-Scart 21 pins / 4 * RCA plug + 2 * BNC plug + 3.5 Mono plug. 3) Blister, bubble or slide blister available, carton. 1)Keeping in touch with you and best service for you ! 2)Our promise, so long as product quality is not good , and find out that it’s our fault, we can exchange or resupply to you for free with my product . We can produce any type of the HDMI cables , RCA cables and SCART Cables. 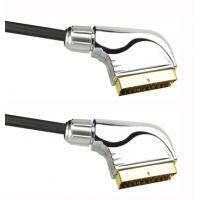 RCA TO SCART cables, no matter -any length, any color ,we can all supply! !